There’s already a Rick and Morty-themed Pokémon knock-off, Pocket Mortys, that satirizes the oft-ignored problematic nature of the whole “pocket monsters” concept, but a new comic series called Pocket Like You Stole It will explore how truly terrible it is to enslave cute little monsters. Except, you know, these cute little monsters are Mortys. Rick and Morty: Pocket Like You Stole It will be a comic book spin-off of the mobile game spin-off of the crazy popular Rick and Morty animated series. It’s the kind of convoluted premise that only Rick and Morty fans can truly appreciate because they love things like interdimensional cable and universes where phones are sentient beings who use pizzas as furniture, eat furniture for sustenance and use people as phones. Due out July 5, the upcoming series will explore more of a universe in which Morty variants are ubiquitous. There’s everything from Two Cat Morty to Cronenberg Morty — but sadly no sight of Lawyer Morty just yet. The very first issue shows a lot of Mortys that fans will appreciate. In Pocket Mortys, you play as Rick, who captures and trains the many Mortys by using Morty Manipulator Chips. The many enemy trainers include but are not limited to various kinds of Ricks in the Council of Ricks set up to be the equivalent of Pokémon Elite Four. Yes, it’s that aggressive of a Pokémon clone. 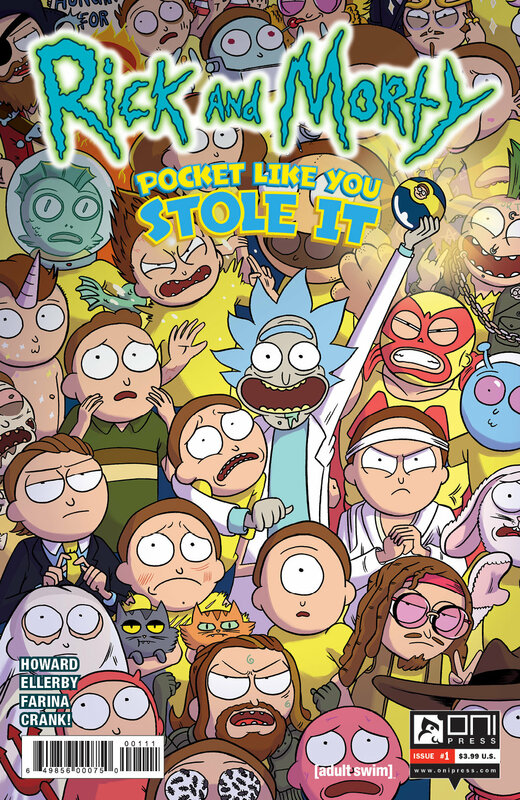 Pocket Like You Stole It expands that universe in a hilarious parody that “turns the world of catching ‘pocket Mortys’ into a bloodsport,” according to an official release from publisher Oni Press. The writer on the comic, Tini Howard, told Comicsverse this week that “Pokémon, as an idea, is pretty messed up,” even referring to it as “adorable cockfighting.” Trainers capture and enslave little monsters to do their bidding, trapping them inside digitized Poké Balls. Howard said of the comic’s premise, “So I wanted to start with Rick’s depraved nature and that, but also link us to a lead Morty, and his perspective, since the game is pretty much about being Rick.” Being Rick in this case means treating all Mortys like they’re slaves to be used and discarded. In 'Pocket Like You Stole It,' Ricks are the hunters and Mortys are the hunted. Though the comic will include a lot of pre-existing Mortys from the mobile game, illustrator Marc Ellerby has also teased new ones like French Stereotype Morty or Emo Morty, along with an entirely new line of Pocket Jerrys that will revolutionize the Pocket Rick and Morty Universe. Each Morty variant the protagonist Morty encounters is pretty fucked up. Pocket Like You Stole It was first teased as part of Free Comic Book Day back in January. It’s written by Tini Howard, illustrated by Marc Ellerby, and colored by Katy Farina. Rick and Morty: Pocket Like You Stole It hits comic book store shelves July 5, 2017.